It is useful to select cultivars that have resistances to the more common insects and diseases and employ crop rotation. Planting sweet potatoes in the same field once every 3 years helps to reduce pests and diseases. Crops most often rotated with sweet potatoes include tobacco, soybeans, corn, cotton wheat, cucumbers, peanuts, and rye. Insect monitoring is important for managing both foliar-feeding and root-feeding insects. Routine field scouting either by the grower, a family member, or a professional scout and the use of light traps and seed baits in the soil will identify which pests are present and what course of action is necessary. Should chemical insect control be warranted, the grower should follow all applicable directions, restrictions, and precautions of the EPA registered label. In addition to adhering to the steps outlined above, it is beneficial to record every pest problem observed and diagnosed in each field or storage lot and keep those records available for future reference. Assistance in diagnosing pest problems is available from county agricultural extension agents. These agents are often able to identify the cause of problems quickly. In addition, many crop consultants and private laboratories can help with these and related services. Lepidoptera larvae feed on foliage leaving small to large, irregular holes. In plant beds and newly set fields damage may be serious. After harvest, larvae may continue feeding on sweet potatoes left in the field and in storage. Management: Apply insecticide to plant beds. Cuttings should be free of insects before planting. Remove harvested sweet potatoes from the field immediately. Two Spotted Spider Mite, Tetranychus urticae Koch. Immature mites and adults feed on underside of leaves and may cause stippling on leaves which appear yellowish, bronzed or burned. Mites favor hot, dry conditions, and often migrate from adjacent vegetation. Management: Minimize application of approved insecticides. Chemical control is usually not necessary. Tortoise Beetle adults and larvae that feed on sweet potato foliage include: mottled tortoise beetle, striped tortoise beetle and (not shown) argus tortoise beetle, Chelymorpha cassidea (Fab. ); black-legged tortoise beetle, Jonthonata nigripes (Oliver); and golden tortoise beetle, Metriona bicolor (Fab.). Leaves of infested plants are riddled with large round holes. Generally damage by tortoise beetles only threatens seedlings or newly set plants. Management: Isolate plant beds and control morning glory. Apply approved insecticides to young plants if needed. 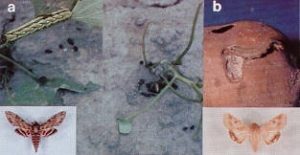 Control beetles on plants around plant beds and fields. Sweet Potato Weevil, Cylas formicarius elegantulus (Summers) is the most serious, worldwide pest. Its northern distribution is on the Outer Banks near Wilmington, NC where it feeds on seaside morning glory. Adults and larvae feed on foliage but prefer stems and roots. Infested sweet potatoes are riddled with small holes and galleries especially in the stem end. They turn bitter and are unfit for consumption by either humans or livestock. Management: Use only seed and plant stocks produced in approved weevil-free areas. All purchased stocks, including out-of-state, must be certified. Use pheromone traps in plant beds, storage houses, and in fields to detect sweet potato weevil. Some varietal tolerance exists. Chemical control is difficult at best. Sweet Potato Flea Beetle, Chaetocnema confinis Crotch. Adult beetles spend the winter in debris, along fencerows, and at the edges of wooded areas. In the spring, eggs are laid in the soil near host plants. There are several generations per year. Adults feed on foliage leaving channels on the upper leaf surfaces. Larvae feed on roots etching shallow, winding, sunken trails on the surface, which enlarge, darken and split. Management: Control weeds along field margins and plow under crop debris. Use resistant or tolerant varieties. In fields with a history of infestation use a pre-plant soil insecticide. Whitefringed Beetle, Graphognathus spp..Larvae feed on roots causing damage similar to that of wireworms and white grubs. Only flightless, female adults occur and feed at the base of plants leaving scars on the stem. They are most active in July and August and produce eggs without mating. Management: Avoid infested fields and rotate crops. Limited control may be achieved with resistant varieties and use of soil insecticides. Wireworms leave small, irregular, shallow or deep holes in the surface of sweet potato roots. Larvae are identified by differences in the last abdominal segment. Wireworm adults (click beetles) lay their eggs in grassy, undisturbed soil. Wireworms may be detected prior to planting using corn, wheat, or oatmeal bait stations. Management: Avoid land previously not in row crops, in sod, or fallow. If necessary, broadcast and incorporate a pre-plant insecticide or use a granular material at root swell. Diabrotica and Systena spp. (not illustrated). Cucumber beetles and flea beetles may damage sweet potatoes. Adults produce irregular holes in foliage and larvae eat small holes through the periderm and form irregular cavities under the skin. Management: Treatment for wireworms may provide some control. Foliar sprays control adult beetles. White grubs cause large, shallow, irregular damage on the surface of sweet potatoes. Species in North Carolina include Japanese beetle, Popoillia japonica Newman; spring rose beetle, Strigoderma arboricola Fab. ; and green June beetle, Cotinis nitida (l.). Adults lay eggs in grassy areas. Management: See wireworms. Nematode problems may be caused by the southern root-knot nematode, Meloidogyne incognita; the northern root-knot nematode, Meloidogyne arenaria; the reniform nematode, Rotylenchus reniformis; and others. Symptoms include plant stunting, yellowing, leaf fall, reduced yields, and roots with cracks and black, partially decayed surfaces. Symptoms are much worse under drought conditions. Management: Assay fields for nematodes in the fall. Avoid problem fields. Treat infested soils in the row with a nematicide prior to or during planting. Use resistant cultivars. Fruit Fly, Drosophila spp. Fruit flies may be a nuisance in storage houses when sweet potatoes decay due to other causes such as souring, chilling, and Rhizopus soft rot. Fruit flies feed on decaying vegetables. Maggots may be seen in decaying roots. Fruit flies may become established in cull piles and spread to the storage house. They do not cause rots. Management: Harvest, cure and store only sound sweet potatoes. Dispose of culls, inspect the storage house and use traps. If necessary spray with an appropriate insecticide. The following Insect Management Program for sweet potatoes was developed by Dr. Kenneth Sorensen, Entomologist, NC State University and Bill Jester, Area Specialized Agent Commercial Vegetables and Fruit, NC Cooperative Extension Service. Develop field histories based on soil baiting (February) and previous experience. Avoid fields with white fringed beetle. Use Admire in plant beds. Use Lorsban preplant. Fumigate with Telone. Scout fields biweekly after transplanting. Apply Admire as a soil drench 30-45 days after transplanting. Increase monitoring in early June. Eg: light traps, sweep nets. Continue sprays every 7 to 14 days until September. Wireworm – larvae in corn baits, 5 beetles in yellow sticky traps or black light trap.